If you are looking for a gift that needs to please, this is it. Falconry experience Leicestershire at Bird on the Hand will give your special person a fantastic time. However, don't take my word for it. Read our Tripadvisor reviews or customer comments to see what a great time our visitors have. And I can offer our unique Money Back Guarantee with the confidence that you will not need it. Birds of Prey Days are Great Gifts that will be loved and remembered. 1. If you find you have made a mistake and a falconry day present doesn't suit the recipient it can be returned within 30 days for a refund. 2. I also give you a money back guarantee the participant will enjoy themself on the day. Watch this video and see visitors enjoying their Bird on the Hand Falconry experience Leicestershire. Check out the smiles and wonderment. See for yourself how fantastic this gift is. Buy the Best! 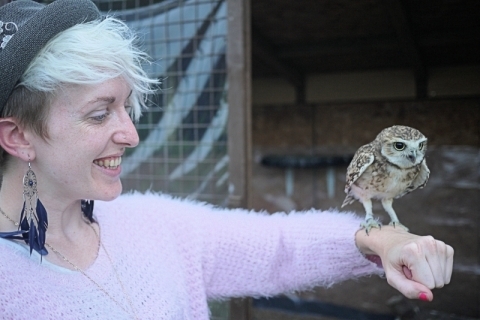 Buy a Bird on the Hand Falconry Experience Leicestershire ! My birds of prey day experiences give lots of handling and up close falconry experiences. 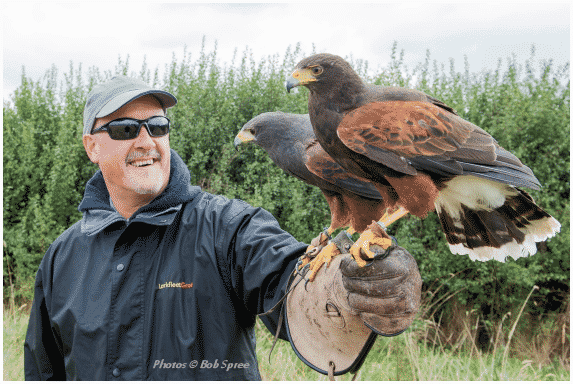 I have a great location here for your Falconry Experience Leicestershire in wonderful countryside with marvellous birds and a generous welcome. An Owl on the Hand experience (Owls, Owls and more Owls) for those owl lovers. I provide personalised gift vouchers valid for 12 months. These can be for your choice of experience or to a money value. Children are welcome from about seven upwards. There are options for companions to join in the fun and they will have a great time too. I promise I will give a great day out that your special person will really enjoy. See below for details of our most popular experiences. A packed half day hands on experience that is both fun and educational. Your session will be spent seeing, handling, feeding & flying many types of bird, which include several species of Falcon, Hawks, Owls and Eagle. This is without question our most popular activity for young and old alike giving a full hands on and flying experience with the birds..
All experiences covered by our money back satisfaction guarantee so you can give this gift in complete confidence. Truly the ultimate outdoor adventure! The afternoon is spent out on the farm. In summer we usually fly an eagle or European Eagle Owl and then we are out into the countryside for a walk with a team of Harris hawks who show there natural capabilities while popping down to you for the occasional titbit. In winter we are out with the Harris Hawk hunting team and ferrets. They are Cute, Fascinating and Amazing. A fantastic memorable experience up with our owls. Thanks once again for such a fantastic birds of prey day and for letting us get to know your amazing birds. It was refreshing to get out of London, forget my worries and just enjoy nature at its best. I shall be recommending the experience to all my friends and family. I’ve had a wonderful, interesting and enjoyable day doing something completely new to me. The birds are amazing to watch and handle and there is so much to discover about every aspect of them. Andrew shared his knowledge in such an easy and engaging way with everyone in the group that we all relaxed and enjoyed the moment. Another visitor having a great day out. We're not called Bird on the Hand for nothing. Maybe we should change to Two Birds on the Hand. Spectators are welcome(there is a charge) but they are up close to the action and can ask questions too. They can take photos and regularly have birds fly past their ears, in fact they get the same experience as the participant apart from not having the birds on their hand Elaine, a spectator, at the end of the day said "I expected to be bored stiff but it was great fun".However, I don't want you to buy a gift for some one and find they are not going to enjoy it. That's why I give a unique money back guarantee.